Do You Need A Portable RV Waste Holding Tank? Growing up, my family and I took many vacations in the family camper. I remember more than once having to spend vacation time waiting in line at a dump station. We didn’t have any portable waste tanks, so the only way to dump the tank was to drive right up to the disposal and make the connection. A portable waste tank eliminates this need as you can transfer the waste from the RV to the tank and then wheel it over to the dump station. If you need help getting your gray water or black water from your camper to the dump station, an RV Black Water Tank is the perfect solution. If you are looking to buy a portable waste transport tank for your RV or camper, there are really only a few brands that dominate the best sellers list. The brands are actually quite comparable in quality and really only vary in price. This means that you can buy any of these brands and know that you are getting the same durable quality for your money. The top brands are Thetford, Barker and Tote-N-Stor. While you may come across some other brands at cheaper prices, I would recommend not to take the risk. The following review focuses on the top quality brands. Thetford Portable Waste Tanks range from 12-gallons to 35-gallons. The size of the tank necessary will depend on your needs. For example, when we took family vacations in the RV it was a family of four for a week or two at a time. Obviously, we would have benefited from the largest portable tank. A family of two or a family on a short trip, however, could get away with one of the smaller tanks. Take a look at the best sellers from Thetford. If you don’t see the size you’re looking for, just click on one of the items to see more options. Barker Portable Waste Tanks for RVs range from 10-gallons to 42-gallons. Take a look at the best sellers from Barker below. If you don’t see the size you’re looking for, just click on one of the items to see more options. As you may have noticed, these look a LOT like the Thetford tanks, with the main difference being the handle. Personally, I prefer the handle on the Thetford models as the handles on these seem a little flimsy…and I would hate for it to break and end up having to carry a full waste tank in my arms. Yuck! 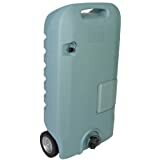 Tote-N-Stor Portable Waste Tanks for RVs range from 6-gallons to 32-gallons. Take a look at the best sellers from Tote-N-Stor below. If you don’t see the size you’re looking for, just click on one of the items to see more options. It is important to note that these tanks do NOT have a handle for pulling. This is drastically different from the other two options. Instead, you get a nice sturdy handle for lifting and carrying the portable tank to the dump station. While these are cheap, keep in mind the strength it takes to move it around. It does have wheels, but without a pulling handle you will get a heck of a backache leaning over to pull it. Any suggestions on where to haul these things with a truck camper besides IN the camper or truck cab? Yuk. I hear ya, Cheryl. Poop tanks are kinda gross. My dad keeps his in the truck bed with a bungee cord, which isn’t as gross as in the camper.